Dino was already a black belt and a martial arts school owner when he discovered Brazilian Jiu-Jitsu, back in 1994. After experiencing the effectiveness of the style first-hand, however, the lifelong martial artist knew he had found a new truth and pursued it with all of his energy. Dino traded in his black belt for a BJJ white belt and traveled around the country searching for the real stuff. Renzo Gracie referred Dino to his cousin Rickson – the champion of the Gracie family – and his garage academy in Los Angeles, and so that’s where he went. Dino traveled back and forth from Chicago to Los Angeles to train with Rickson and his deputy Luis “Limao” Heredia, and has flown that flag for decades, eventually earning his black belt in Jiu-Jitsu from Heredia. Dino sought early-on to test his Jiu-Jitsu skills in MMA competition, back before the sport was even well-regulated. From there, he continued to refine technique for himself and his students and became a coach to many local and international fighters. Ultimately, Dino has become a Chicago MMA figure. Dino coached Andrei Arlovski from his first UFC fight all the way to a world title and beyond, and has also coached other top fighters like Clay Guida, and Mark Miller. Despite all his success coaching professional fighters, however, Dino takes the most satisfaction in creating a team and academy where people from every walk of life, with widely varied goals, all feel at-home, safe, and have a blast while life-skills that can help them protect themselves and their loved ones. As a coach and practitioner, Dino leads by example, carrying with him a “white-belt” mentality and peerless work ethic. 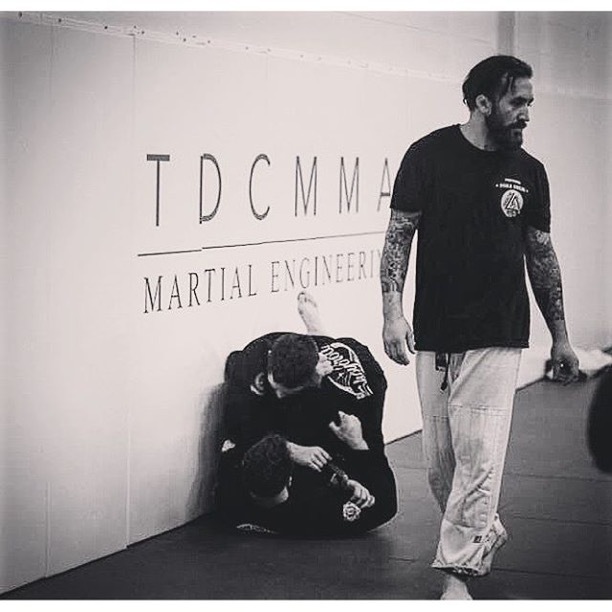 In addition to his BJJ and traditional martial arts training, Dino studied Muay Thai for nearly a decade under Said Hatim, who is a TDC BJJ brown belt. No one puts in more hours on the mat and on the bag than Dino, and that drives the whole team to continue their hard work. Dino uses an old-school, attentive, caring, and intensive approach to make sure all his team members become great fighters in life. Outside of coaching MMA in Chicago, Dino loves spending time with Nola his dog and a gift from Andre Arlovski. Dino also enjoys taking action shots of his students and peers and displays them on his Instagram account.